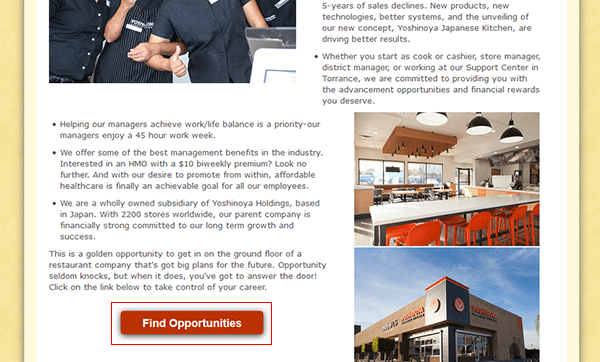 The Yoshinoya job application can be filled out and submitted online via the company’s careers page. Use the link at the top of this page to go directly to the employment site. The instructions posted in the below guide can be used as a reference when navigating the online jobs site (use them to learn how to search for openings, submit an application, etc.). Both restaurant and support center positions can be searched/applied for. About the Company: Yoshinoya is a Japanese chain of fast food restaurants headquartered out of Tokyo. The company operates more than 2,000 locations throughout the world, and more than 70 in the United States (in Southern California). Step 1 – Go to the company’s main careers page (click here). Scroll down the page and then press the button as outlined below (“Find Opportunities”). 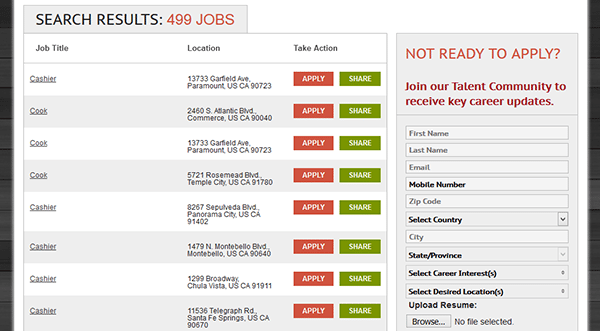 Step 2 – Search the main listing of openings by selecting a career category, state/region, or city from the drop-down lists. The results will automatically update (below the form) as the variables are altered. Step 3 – Press the job title link of the position that you want to apply for. Step 4 – Read the job description and then click the button as outlined in red below. Press the “Start Here” button to go to the next step of the process.